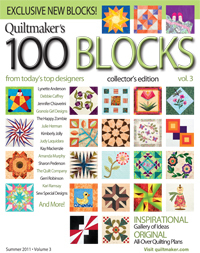 Volume 3 of Quiltmaker's special edition magazine 100 Blocks will soon be on sale at quilt shops and newsstands, and one of my blocks is in it! My designer's copy of the magazine arrived last week. 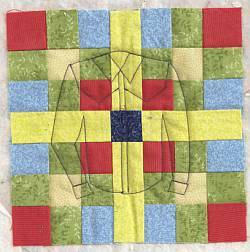 It's full of great blocks ranging from easy to complex and with representatives for every major method: pieced, foundation pieced, applique and combination methods. There's also a range from traditional geometric to whimsical fun to drop-dead gorgeous. It's going to be difficult choosing which block to try first. Quiltmaker is hosting a blog tour of the designers' blogs starting May 2 with lots of giveaways! Check it out here: quiltmaker.com/100blocks. And stay tuned here, too, as I have a few issues of the magazinne to give away. I just have to decide how. And I'll be showing off my block, giving you color variations and ideas for using it. Color B - light - 1 yd. Color C - medium - 7/8 yd. Color D - medium - 1 yd. Color E - dark - 1 1/8 yd. Color F - very dark - 1/2 yd. These amounts do include some leeway for a few miscuts. If you are still concerned about shrinkage and more than a few miscuts, or simply want extra fabric for your own creative interpretation of my design, add another 1/4 yd to the amounts listed above. Colors A & B - 3/4 yd. Colors C, D, E & F - 3/8 yd. This quilt will finish at 81" x 105". For binding, you will need 10.5 yds. of purchased binding or 3/4 yd. fabric to make your own double-fold binding (non-bias). Here are the yardage requirements for the Home on the Range BOM when using 14" blocks. These amounts include a little extra for a few miscuts along the way. 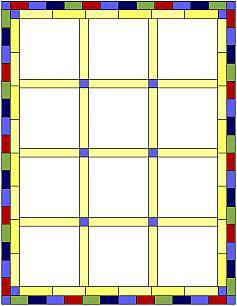 Excluding sashing, the largest pieces in the BOM are 5" squares and 2.5" x 6.5" rectangles, so an extra 1/4 yd. will go a long way in covering any mistakes. Add the extra 1/4 yard if you're concerned about shrinkage or multiple miscuts or just want extra fabric to play with creative urges along the way. Amounts above include 2.5" (2" finished) wide sashing and cornerstones, but do not include borders. The border that I designed is pieced and makes the most of our precious fabrics. If you decide to use this border, add 1/4 yard to all of the yardage amounts above. Finished size of this layout with 14" blocks will be 54" x 70" - large enough for a sofa throw or a twin bed topper (nothing to tuck in at the foot of the bed). For binding, you will need 7.25 yds. purchased binding or 1/2 yd. fabric to make your own double-fold binding (non-bias). After tracing the image, I cut away the excess paper, pinned it to my Tonganoxie 9-Patch block sandwich, then stitched on the lines just like when doing foundation paper piecing. The only drawback to this method is pulling off the paper when finished - just like paper piecing, it can be a tedious pain! Here it is with half the paper removed. The paper looks much like a tiny white shirt! 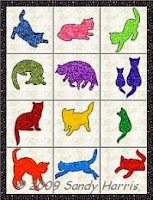 I'll have to try this as an applique someday using white batiste or some other sheer fabric. Paper is now completely removed. This method went fast for quilting one 7" block. If doing a lot of blocks, I'd want a paper that was even easier to remove like the disolvable kind. 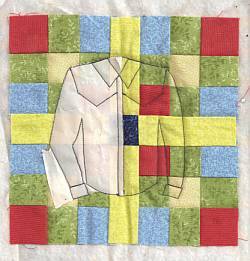 As a 7" block, the Tonganoxie 9-Patch is so small and busy that I didn't try the shirt as an applique. The appliques can always be used on another block, though.